Central Excise (T.N.) Circular No. 204/2/2017-Service Tax dated 16.02.2017 Applicability of service tax on the services by way of transportation of goods by a vessel from a place outside India to the customs station inIndia w.r.t. goods intended for transshipment to any country outside India. Central Excise (T.N.) Standing Order No. 5/2016 issued by the Chairman, Customs, Central Excise & Service Tax Settlement Commission, Ministry of Finance, Government of India vide F.No. A-1/Misc/ Office Order/2016-SC(PB) dated 6th February, 2017. Central Excise (P.N.) Section 4(1)(b) of the Right to Information Act,2005 Declaration under Right to Information Act, 2005. Central Excise (P.N.) Re-designation / Appointment of officer as CPIO under Right to Information Act, 2005. Central Excise (T.N.) 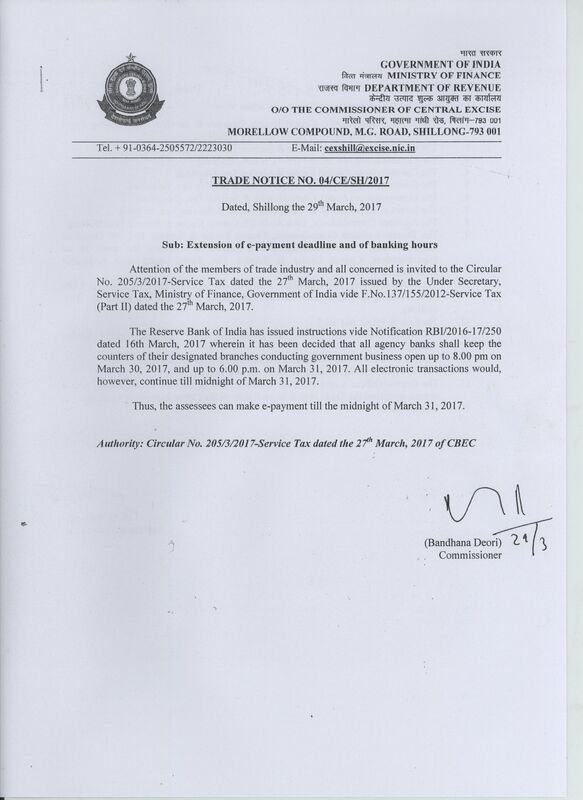 Circular No.206/4/2017-Service Tax dated 13th April, 2017 issued by the Technical Officer (TRU-II), Ministry of Finance, Department of Revenue (Tax Research Unit), Government of India, vide F.No.354/42/2016-TRU dated 13th April, 2017. Central Excise (T.N.) Clarification on issues wherein the goods are moved within the State or from the State of registration to another State for supply on approval basis. Central Excise (T.N.) Procedure regarding procurement of supplies of goods from DTA by EOU/EHTP Unit/Software STP Unit/BTP Unit under deemed export benefits under Section 147 of CGST Act, 2017. Central Excise (T.N.) Due date for generation of FORM GSTR-2A and FORM GSTR-1A in accordance with the extension of due date for filing FORM GSTR-1 and GSTR-2 respectively.